The ‘Handbook for Parish Pastoral Councils in the Diocese of Kilmore 2016-2020’ states that “the Parish Pastoral Council is concerned with mission, with people and with building up the faith, hope and love that cements them into a real, living and caring Christian communion”. The Pastoral Council convenes at regular intervals throughout the year. The council’s aim is to further the mission of Christ and his Church in the community. • The Platinum Jubilee of the ordination to the priesthood of Monsignor PJ McManus was discussed at one of the first meetings of the council. It was decided that Monsignor’s seventy years of church ministry would be marked with a Jubilee Mass in St Mary’s Church, Crosserlough on 2nd July 2017. On the day itself, the church was packed to capacity and the chief celebrant at the Mass was Most Reverend Leo O’Reilly, Bishop of Kilmore. A photo album of the day’s events was produced by local photographer, Marese Callaghan. The album was presented to Monsignor McManus at Mass on Sunday, 3rd December 2017. • The Pastoral Council, in collaboration with the three local primary schools, has secured a team of efficient and enthusiastic altar servers in each church area for 2017-18. At present we have over thirty altar servers in the parish. 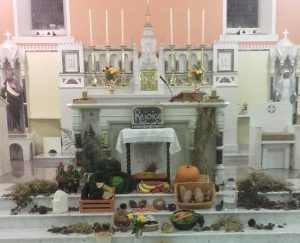 • Harvest Thanksgiving Masses were held in all three churches in the parish on the weekend of 21st and 22nd October 2017. Colourful displays of God’s bountiful produce adorned the sanctuaries in each church. Deirdre Carolan, a representative of World Vision, spoke to the congregations about the charity’s ongoing work educating children in Uganda. A collection was taken up at Masses and the funds raised were passed on to World Vision. • The Pastoral Council plans on having a Parish Mission during April 2019.
aware that You have called us and that we gather in Your Name. Come to us, remain with us and enlighten our hearts. along with the strength and courage to make Your Will our own. You have for our parish and how You are calling us to serve. Unite us in the love of Jesus Christ and keep us faithful to all that is true. so that our discussions and reflections may help us earn the reward promised to good and faithful servants. Father and the Son, one God, forever and ever. Amen.